Collected baseball cards from 1986-1995, and again from 2014 to Present. A simple blog to discuss the hobby. Taking the lead from Tony at Off-Hiatus Baseball Cards this will be the fifth of 30 posts, using the prompts provided. I won't necessarily post one every day, but I will do one for each card, toss in a few "insights" (as insightful as I can be, anyway), and usually include an honorable mention or two, just because I'm like that. Here's my pick - I was so proud of being non-partisan in the first few posts - I didn't plan on making this a 30 Days of Twins baseball cards... Puckett was a no-brainer for me, though, and so is this card. It was only a matter of time before Kennys Vargas would show up. I picked up this card on eBay recently, I wasn't sure that I would ever get the chance. This is a redemption card numbered to 100 from 2014. 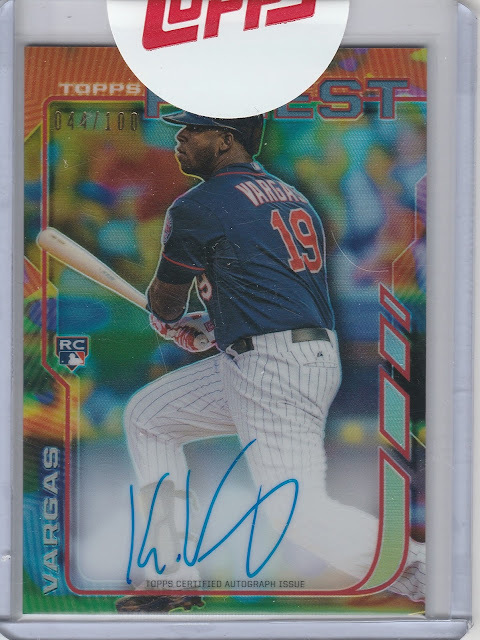 Not a lot of 2014 cards of Kennys Vargas. 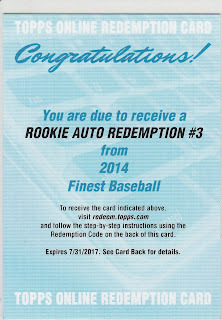 He's in Bowman Sterling, Topps Heritage High Numbers, and as the Rookie Redemption #3 in Topps Finest - that's pretty much it! There may or may not be a couple minor league issue cards out there, but those are the only three from the big guys. This one had to be the pick because it's my favorite *current Twin; it is a rare card in the wild; and it's a little bit off the beaten path, which is always a plus for me. *currently in AAA, but he's on the 40-Man! Since these are basically one card posts, why not show the backs, too? I haven't shared this card on the blog previously, but I was really pumped when it came in the mail. I'm hoping that Vargas and/or Park gets called up soon, hopefully to jump start the stagnant Twins offense. The three man bench lacks offense right now. 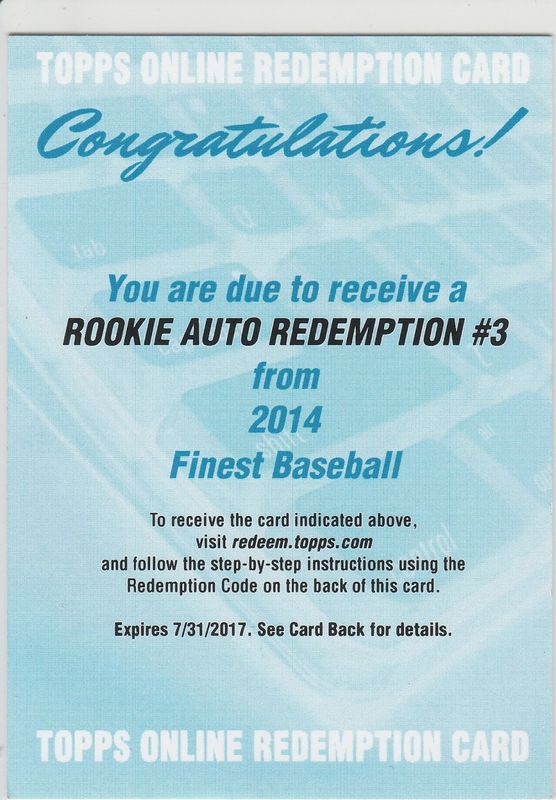 The seller even threw in the original redemption card, sweet! Aparicio is not necessarily one of my favorite players, but he is a Hall of Famer and this is one of my favorite cards. Dawson has one of the more interesting looking signatures in baseball, even though this example is not his finest penmanship. 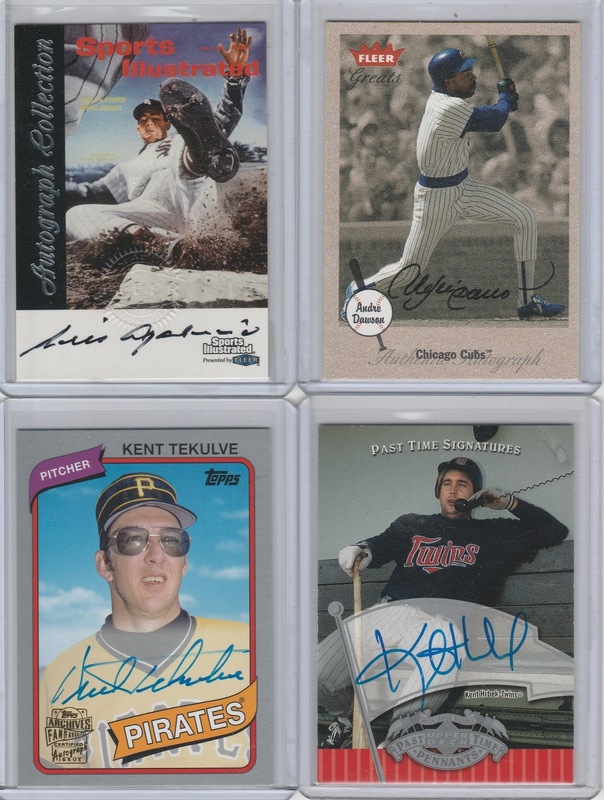 Teke is one of my favorites, and Topps was smart to include him as a fan favorite. Of course I couldn't pass up the opportunity to show another Hrbek on the horn card. His auto is a little sloppy this time around, he was probably eating a footlong meatball sandwich in his other hand... J/K Hrbie, you're the best! Interested in reading baseball card blogs and possibly starting one of my own. Re-entering collecting after many years away from the hobby. I read these and so can you! Transatlantic Triple Break - 2017 Diamond Kings!